When I was deciding upon which open-source defect tracking tool to use in our company, I mainly looked into Bugzilla, Asana, and Redmine. Asana was already being used by the development team for task management. But, till I joined, there hadn’t been much of a separate process for logging bugs. Whatever issues the developers found were logged as ‘tasks to be done’ in Asana. Till then there was not much of a ‘bombarding’ of identified issues, because there wasn’t a testing team till then. Asana is very good as a task management tool, but it lacked some features I consider important for a defect tracking tool – like the consolidated issue lists/summary, and reports. So, I went through the demo versions for both Bugzilla and Redmine. 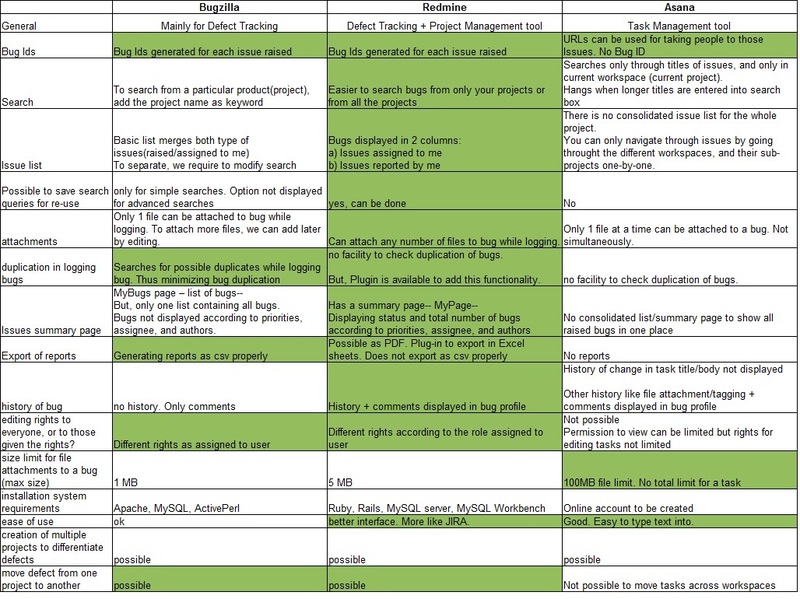 Bugzilla is a good tool, but I think Redmine, being a cross-over of Bugzilla and JIRA, is a better choice. Below is a comparison chart I made to compare the tools. So, finally I chose Redmine. And I am really glad. Installation is very easy if you choose to install it through Bitnami Redmine Stack. The stack does all the configuration and installation for you. It makes it so easy to go through all raised issues, and to extract reports according to whatever parameters I want. For example, Whenever a new tester joins, I extract the latest list of all the issues ever raised for a particular project from Redmine and ask him/her to go through all of them. This would help him/her understand the product better, in addition to preventing the logging of duplicate bugs in the future. And if I want to see only those issues raised by a particular tester in my team, I can always go to the Issue search list and add a parameter “Author = <author_name>” in the search criteria. Also, there are many Redmine plugins available online to customize your Redmine instance however you want it. I would go ahead and recommend Redmine to everyone who’s deciding on a defect tracking tool. It will surely make your life easier. Can we can use REST API of Redmine to create following features? When creating new tasks, you can specify the prescribed time frame. Later, when the task is being executed, you see the usage of the time estimates. Sharing knowledge among employees and projects is a way to successful project management and a more efficient company. Knowledge base module provides an easy way of collecting, recording and sharing knowledge contributions. Client ( Dev manager or product team) enter the requirements for developers and QAs which are then being discussed and implemeneted in the desired time. This can be to validate what was discussed and what is implemented. It can also be used for product Workflow , i.e. requirement specs, implementation, testing and putting in production. These features are available in Redmine as follows. And as REST API supports working with the related features namely Projects, Issues, and Wiki, we can use it for the features you suggested. 3. Knowledge Sharing, Knowledge Base – The Redmine wiki can be used for this purpose. 4. Requirements Gathering and Management – I document all the given requirements as “features” (a sub-category of ‘Issues’) in Redmine. Issues can be divided into bugs, features, tasks, and support. We can further add more sub-categories (if required) for issues.